Love knot stud earrings feature a delicate overlapping designs which have been crafted with high level of precision. These earrings are made up of 14K gold. These earrings are designed in such a way that the earrings look like knots which make the shape of a heart. This unique design of these earrings makes them perfect. The size of these earrings is 7mm and they are the push-back type, which makes it easy for the women to wear the earrings and let it give them a more splendid look. 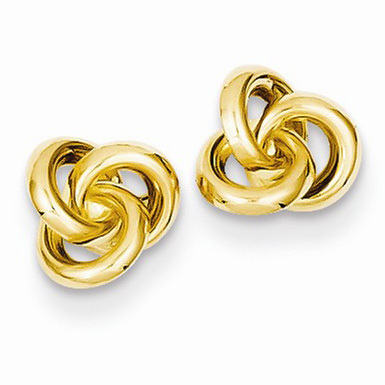 We guarantee our 14K Yellow Gold Trinity Love Knot Earrings to be high quality, authentic jewelry, as described above.